Once upon a time, shaving was a true art. The face was a canvas that was beautifully sculpted using quality precision tools, not cheap pieces of plastic that needed replacing every week. Back in the day men shaved their beards with finely-made tools known as safety razors. I wanted to put together a list of safety razors that will help you find the best razor out there to shave with. We’ll look at various prices ranges, razors for beginners and of course safety razors for the seasoned wet shavers. Let’s start out with a quick safety razor list below. I wanted to share that any of the safety razors below would make a great Christmas gift for you husband, dad or boy friend. So find one that sounds good to you and has the right price and your man won’t be disappointed. There are tons of different options available today. Several companies manufacture high quality manual safety razors and blades. The problem, though, is finding the right one. While there are plenty of razors to choose from, not all of them are created equal. The good news, however, is that we’ve already done extensive testing and research to determine which razors are the absolute best. After testing dozens of them, we’ve narrowed down the variety to a simple list of the top quality safety razors on the market today. These razors made the cut because of their quality construction, ease of use, durability, and, most importantly, performance. This list is designed to help you get the best razor for your personal shaving needs. 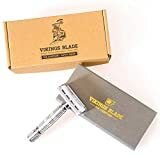 There are various aspects to consider when deciding what safety razor to go for such as the number of parts, weight, handle length, style and type of comb. Here we will take a look at some of the top ranked players to give you a little bit of a head start on choosing your next razor. The Merkur Classic or 33c model is a traditional, well-made razor that will certainly remind a man of the good ol’ days. It’s a tad lighter than some models, has a moderately long handle, and is stylist-approved. On top of that it’s easily one of the most affordable razors around. This is best-suited for men with thinner beards though. Thicker-haired men will find that the razor takes several passes to get a clean shave. The handle is short as well. So it’s easy to handle but for some with larger hands you will want something down the list. It’s a great one to start with for beginners for sure. Want to know more about this razor? Take a peek at our complete Merkur Classic review for an in-depth look at this classical piece. Merkur not only make great razor blades, but also produce a fantastic long handled safety Razor and their Model 180 provides exceptional value. Built for men with big hands, the Merkur Long-Handled Safety Razor is one of our absolute favorite models. Featuring an extra-long handle, a stunning chrome finish, and a water-resistant construction this is definitely an excellent choice for both shaving enthusiasts and safety razor beginners. The longer handle is similar to traditional cartridge razors which makes the transition much easier, too. This is probably not ideal for anyone in the shaving game a long time. Those of you looking for the “best in class” I would continue down the list. 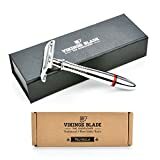 While this razor delivers great results, if you are willing to spend a few more dollars you can get a shaver a bit more aggressive and sharper looking. Be sure to read our full review of the Merkur Long-Handled razor to find out why we like it so much. The Merkur #34C is an excellently weighted and beautifully crafted razor. It’s by far one of the most popular choices of shaving enthusiasts. Featuring a stainless steel construction, a double-edged razor, and imported from Germany, this is a great razor to start with. It gives a fairly close shave, looks great in the bathroom, and feels good in your hand. It’s biggest downfall, however, is the shortness of the handle. The razor has a lot going for it, but it leaves a lot to the imagination. Be sure to read our full review of the Merkur #34C safety razor for more information. The Edwin Jagger DE89bl is a masterpiece of a razor. It features a double-edged blade that is capable of trimming even the most stubborn hairs as close as possible. The razor is very well-balanced making it a breeze to make quick and easy passes over your face and get an excellent shave. It even comes packaged in a gorgeous Edwin Jagger card presentation box that screams sophistication and masculinity. Click here to check out our detailed review of the Edwin Jagger DE89bl to learn more about the razor’s durability, construction, performance, and more. Equipped with a butterfly-opening style that allows for super easy blade replacement, an incredible-looking chrome-plated brass frame, textured handle for superb grip, and a heavyweight design, the Parker 99R has completely stolen our hearts. Compared to the other tree part razors referred to, this Parker 99R features a turn to open handle which gives the user easy access to the blades when switching. You probably gathered from the name that this razor prides itself on being long and heavy, and is one of the largest razors in production. Its textured chrome finish provides a vintage premium feel also which is appreciated considering the price point. Without being too condescending, there is definitely a “manly” feeling that accompanies a razor that is sturdy and heavy. The 4 inch long handle does have its benefits and allows for a sure grip which is always important when wet hands and shaving foam are around! If you’re looking for the most macho and sturdy safety Razor then this product by Parker is definitely the one for you. This is by far the best safety razor that anyone could wish to get their hands on. The unit is beautiful, it fits in your hands easily, it’s extremely simple to use, and it gets a perfect shave every time. Really, though, what are you waiting for? Go get this razor! Read our full review of the Parker 99R here to discover why it made the top of our list and why we recommend it so much. Believe it or not, though, safety razors are still around. They’ve just been overshadowed by the cheap shavers with three, four, or five blades that are heavily advertised on TV, in magazines, and even online. Shaving enthusiasts are probably the only people using safety razors today, but, because some consumers are getting sick of having to buy new blades every week at ridiculous prices, these fine tools of the past are starting to make a big comeback. Safety razors are quite different from the most common shavers of today that are provided by companies like Gillette and Schick. The blades were much sharper, the handles were made of durable metals, they performed much better, and they lasted a lot longer. Manual shaving is an art that covers a wide demographic of shavers that produce a very close shave, especially when compared to some electronic shavers. The name itself indicate that they are easier to use than straight razors as well. This means that they are great for those who are beginners and new to the world of wet shaving as well! Remember that once you become part of the manual shaving club it’s a new ball game. It is an art to get good at it but once you do you love it. The whole part of using a personal shaving brush, shaving cream and using a manual shaver like they did back in the day, gives you that “Man” feeling every morning when you are done! These are just a few of the best out there. It is really up to you to decide what price point suits you best. 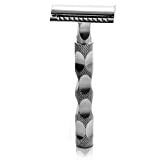 You can find more Information at Amazon here for top rated safety razor features. You can check out other popular wet shaving articles that I have wrote. Do you need new de blades ? Read Best double edge razor blades. Time for a new shaving brush ? 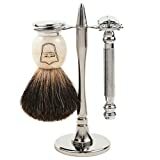 Check out Best shaving brush reviews. Want to try some new shaving soap read Best Shaving Soap Reviews as I cover various brands you will like.